One of the worlds best known gourmet mushrooms also has proven health benefits. With a high nutritional profile, Shiitake polysaccharide and beta-glucan extracts help reduce cholestreol, acts as a potent tonic for the liver, reduces harmful bacteria in the gut and can even increase T-cell count in the blood. Lentinus Edodes is one of the best known medicinal mushrooms, but is more famous for its use as a gourmet culinary ingredient. 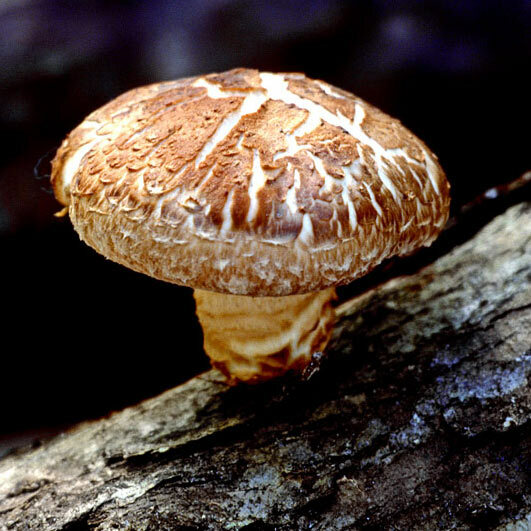 Since the 1960's Shiitake has been the subject of intensive research as an anti-cancer agent. LEM, a crude mycellial extract from Lentinus Edodes with proven immuno-modulating properties contains glycoproteins, nucleic acid derivatives, vitamin B compounds and ergosterol while Lentinan, a highly purified polysaccharide from Lentinus Edodes, is licensed in Japan for the treatment of gastric cancer. Shiitake (Lentinus Edodes) is a prized mushroom with a delicious taste and texture. It is used medicinally as a support dietary product for diseases involving depressed immune function-including cancer, AIDS, environmental allergies, Candida infections, and frequent flu and colds. Shiitake is also beneficial for soothing bronchial inflammation and regulating urine incontinence (Bo and Yun-sun, 1980), as well as for reducing chronic high cholesterol (Although the Oyster Mushroom, Pleurotus Ostreatus is the most potent cholesterol reducer). Standardized extracts, rather than actual mushrooms, are preferred for health purposes because the amount of polysaccharides and beta-glucans can vary widely in the natural fruiting body. Each 500mg Shiitake vegetarian capsule contains 250mg of 30% standardised polysaccharides and 250mg of 30% standardised beta-glucans.